SF and Nonsense: Talk about epic! On June 12, Tor Books will be releasing a discounted five-ebook bundle of the entire Fleet of Worlds series. That's my joint venture in Known Space with Larry Niven. Bottom-lining it: This is an epic offer on an epic -- and much acclaimed -- hard-SF story line that spans centuries and light-years. A story line with: Existential dangers. Larger-than-life deeds, both villainous and heroic. Truly alien aliens. Amazing advanced technologies. "…Needs recommending within the science fiction community about as much as a new Harry Potter novel does – well, anywhere." "A snazzy thriller/mystery that keeps us (and our hero) guessing until the very end … Wide screen galactic scope, nifty super-science, crafty aliens, corporate corruption and cover ups, and a multi-leveled spy vs. spy vs. spy mystery with little being as it first appears make Juggler of Worlds a first class exemplar of pure SF entertainment." "Combines sparkling wit and ‘old school’ hard sf with masterly storytelling and cosmic vision … enjoy the return of good, old-fashioned sf, packed with ideas, philosophical musings, and plenty of space action." Have I piqued your interest? 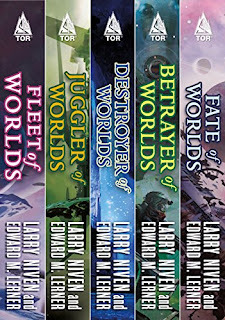 On Amazon, check out The Complete Fleet of Worlds for Kindle (or visit other etailers for additional popular ebook formats). And if you're not ready to make a five-book commitment? Fair enough. You can read about any individual Fleet series title by clicking its corresponding cover on the right. Today, it's official. And still epic.